Mohammed Rafi is known as the legendary singer of the Indian movies. The simplicity of his song, as well as his personality, attracted scores of music directors towards him. They soon became bound by the divine voice of the great singer, Rafi, who later became known as Rafi Saab. Yes, the respect he received from the people not only from India but also from other parts of the world is evident from the growing number of Rafi fans even in this century, after 26 years of his death. Allah Mere Allah is a simple tribute to Allah, the God. The worth of this song lies in its simple melody and rhythmic music that touch the heart of every human soul who believes that there is something in the world that is much above than those we see around us. Through this divine music, Rafi makes us realize that God is the only power that is above everything in the world. Through the song Allah Mere Allah, the creators of the song wish if God takes care of us from all the evils of the world. The request of the singer is clear: Duniya mein mere abaroo rakhna. If it is not Mohammed Rafi, who else could make the message of the song so clear like this? We had many great singers, including the famous Kishore Kumar, Manna Dey and many more. It must be the uniqueness in the style adopted by Rafi that made his voice recognized by a variety of music directors as well as music enthusiasts. He was gifted with a versatile voice and no one could imitate a style like that of Rafi Saab even if many tried to do so. If music is thought to be a divine gift, Rafi would be considered as one of the most blessed. However, if one thought that Rafi is all about Hindustani music, that assumption would be interpreted as a blunder. 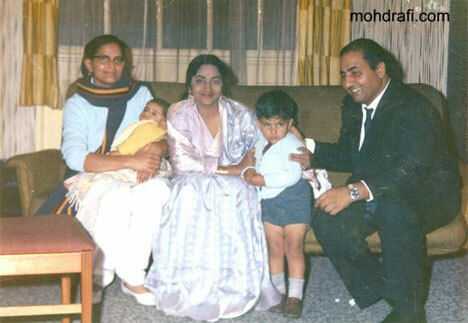 Rafi was well versed with a variety of Indian as well as international music too. He started his career in music with Punjabi songs. Later he became equally good at varieties of music including Pop, Qawali, Bhajans, Parody, etc. Rafi chose music as his life-driving force. He communicated with the world through his music. With the help of the godly voice, he taught the world that the boundaries lie only in the minds of the human beings. He communicated through his music that there is only one truth in the world – the God. To an extent, Rafi’s contribution to humanity can be considered as the greatest. Allah Mere Allah will reverberate in the hearts that are craving to arrive at the ultimate truth, the God. It is not only because of Rafi’s voice, but also because of the great idea conferred by the lyrics and the great effect transferred through the music of Allah Mere Allah. This entry was posted on Thursday, July 5th, 2007 at 9:26 pm	and is filed under Audio Songs. You can follow any responses to this entry through the RSS 2.0 feed. You can leave a response, or trackback from your own site. Rafi sahabs rendering of this Naad brings tears in my eyes. Main is desh ka ek aam sa aadmi hoon aam zindagi guzaarta hoon aur aam logon ki bhasha bolta hoon, aam sa aadmi hoon isliye ek aam aadmi ke jazbaat unki zaroorat , unki khushi aur unke dukh ko bhi samajhta hoon aur yeh bhi samajhta hoon ke jahan aawaz nahi hoti wahan per bhi kuchh un-suni sadayen hoti hain, jahan protest nahi hota wahan per bhi kuchh tamannaon ke poore hone ki khawhish zaroor hoti hai. WHO AAWAZ JISE HUM APNE GHAR, APNI ZINDAGI, APNE RADIO, APNE DISC AUR TV CHANNELS,NEWS PAPERS â€¦.. APNI SOCH, APNE DIL SE ALAG NAHI KARSAKTE. Woh aawaz jisne na jaane kitne Heroes aur Music directors ko unki pehchan dilai. Woh aawaz jo â€œvoice of starsâ€ rahi. Who aawaz jisne hamen 28,000 se bhi zyada geet diye. Who aawaz jis ne logon ko apni aawaz ke zaria family planning ke liye per utsaahit kiya â€œlal tikonâ€ jaise geet ke zaria. JI HAANâ€¦.. MAIN BAAT KAR RAHA HOON USI AAWAZ KE MAALIK â€œMOHD.RAFIâ€ KI. JO EK INSAAN KE ROOP MEIN SANGEET KI DUNIYA KA EK DEVTA HAI. JO APNE HI MULK MEIN APNE HI LOGON KE DARMIYAAN APNE HI LOGON KE HAATHON RONDA JAA RAHA HAI. Main poochhta hoon unlogon se jo sarkari taur se sammanit karne ke adhikaari hain ke kya mehez ek 5 rupiye ka daak ticket unki shaksiyat ko justify karta hai??? JIS INSAAN NE HAMESHA KHUD KO SECULAR, WATAN PARAST, EK BULAND INSAAN, EK BULAND SHEHRI SAABIT KIYA, JISNE HINDUSTAN KE NAAM KO SAARE JAGAT MEIN OONCHA KIYAâ€¦ USKE LIYE AAJ TAK SARKAR NE KYA KIYA?????? AUR AGAR KIYA BHI TO SIRF ROTE KE AANSOO HI PONCHHE , DUKH TO DOOR NAHI KIYA?? â€œBHARAT RATANâ€ KE PURASKAAR SE SAMMANIT KIYA JAAEY. Yeh demand bahut hi secular hai kisi proper caste ya creed ki taraf se nahi kyun ki RAFI SAHEB artiste thay, funkaar thay, poori Hindustani qaum ke asset thay who dilon pe raaj karne waale aise Shahenshaah hain jinka raajj aaj bhi hamaare dilon pe hai. Agar is aam se insaan ki khaas baatein sarkar ko pasand aayen to aisa karke hamari sarkar ki izzat aur bhi badh jaegi aur hamen bhi ehsaas rahega ke hum ek SECULAR AUR DEMOCRATIC COUNTRY ke baasi hainâ€¦. Us desh ke baasi hain jahan sirf paani ki GANGA hi nahi bahti bulkay insaaf , sachhai, adhikaar aur samman den eke liye jazbon ki bhi ganga behti hai. One of my favourite songs too. In fact, the first time I heard it, I had not heard the full song which was in a friend’s place. But sooner, I got hold of the song. I fully concur with Mr. Venkatadri who first introduced me to this song that Mohd. Rafi sang the song in a superb devout way and the other Bhajans that were quoted by Mr. Venkatadri too were all rendered with equal devotion. Truely, Rafi Saheb is the perfect example of a SECULAR individual who can do justice to any religious song. He sang them all from the bottom of his heart. One of the finest songs ever indeed. Request Mr. Hussein Sheikh and Unknow1 to be in touch with me too on my email id which is asmurty2@rediffmail.com or rafimurty@rediffmail.com and some of the songs that I may require, please forward them. Thanks very much in advance. Mohd rafi songs are not for sale,i have around 2000 songs if any one want any song I can send him if I have it only my email is a511@hotmail.com,I also very thankful to Mr Hussein who send me some songs…. Very emotionally sung by Mohammed Rafi Saheb, whether it was Naad, Qawwali, Bhajan, or any religious song, Rafi Saheb was superb in any song. So nice song, and so nicely sung by the legend. This song is always on the top of my collection and I love this song and its singer! I always cite to my friends this song along with “Paaoon Padoon Tore Shyam” and “Jai Raghunandan Jai Siyaram” to prove that the singer himself has clear traces of God in him!